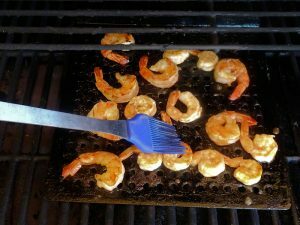 I love grilled shrimp but I have never really cared for it with tomato based commercial barbecue sauces. I just find them too sweet for the already sweet shrimp. I have been using Koss Sauce for several of my recent cooks. It is a barbecue sauce but it isn’t as sweet as most and doesn’t have the big tomato base taste of most. I thought it might go well with shrimp. 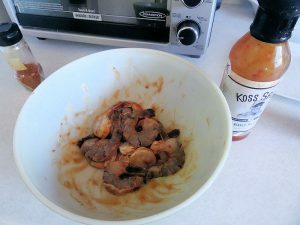 I tossed 16 medium shrimp with creole seasonings (you can make your own or use a commercial blend) and then Koss sauce. I preheated my Louisiana Grills pellet smoker to 220 F with a grilling grate in the smoker. 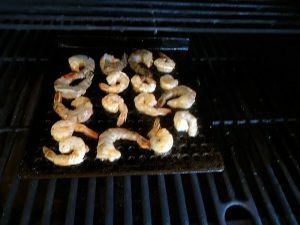 I smoked the shrimp for 15 minutes. I brushed the shrimp with the Koss sauce remaining in the bowl and smoked for 10 more minutes. This is incredible. The Koss Sauce has a touch of tart with just enough sweet to balance. By using a small amount for a glaze it doesn’t overpower the shrimp and just gives it a nice colour, a complex taste and a great bit of spice. Preheat a smoker to 220 F. You could also cook on a gas grill over low indirect heat. 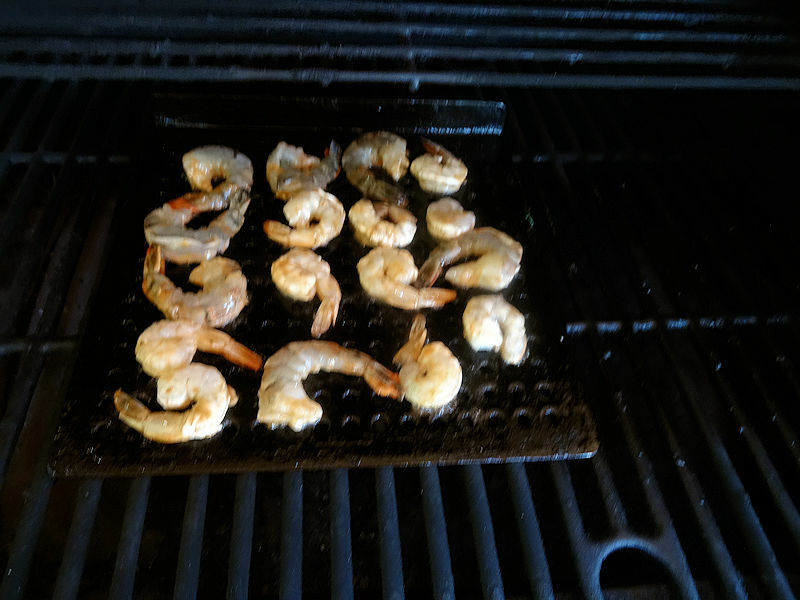 I like to use a grilling tray. Toss the shrimp with the sauce and seasonings. 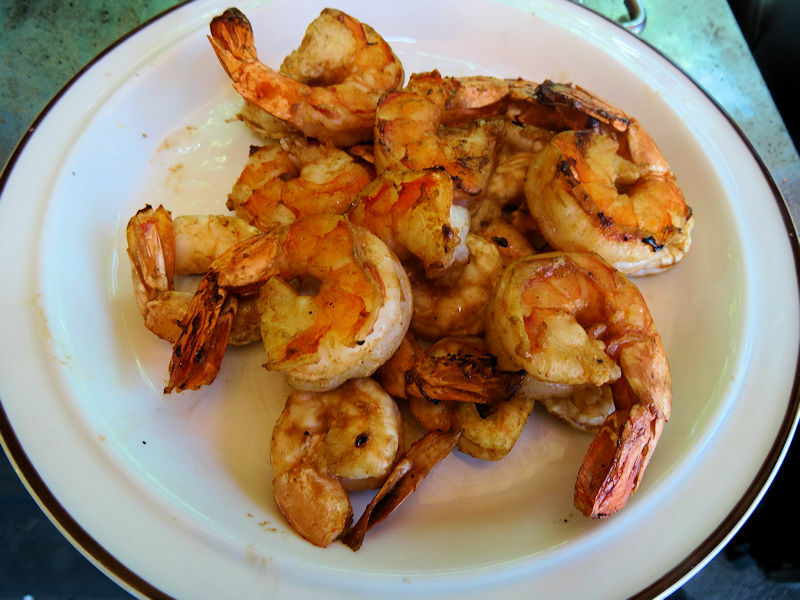 Turn the shrimp and brush with any sauce remaining in the mixing bowl. I’ve never had a shrimp I didn’t love. I’ll have to keep my eyes peeled for the Koss sauce. Thanks, Jeff. At this time I think you can only buy Koss Sauce from the makers on line.